As you all know, the dog we got 2 weeks ago is a Yorkshire Terrier mix. I did want to learn a bit more about caring for this type of dog, training it, and anything else I might learn that would be new info to me. Whether you are thinking about getting a Yorkie or just want to learn more about the one you already have, Yorkshire Terriers for Dummies is a valuable resource filled with helpful suggestions on living with this 6th most popular dog breed in the United States. In this book you will learn about Yorkie’s specific nutritional needs, breed characteristics, grooming, health care, behavioural problems and so much more. Best of all, the book is easy to read and interesting which will make learning about your little energetic, lovable companion, all that more fun. As you better understand Yorkies, your life long bond will strengthen and grow. 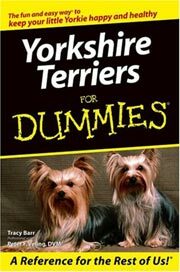 If you own a Yorkie or know of someone who does,this a perfect book to pick up.